Sports Hip Flasks – here at The Pocket Hip Flask Company we know just how much sports mean to people. We know that sports come in so many different forms and we have tried to encapsulate as many as we can into our ever growing range of hip flasks. We have chosen some of the most popular sports and also a few obscure not so common sports. 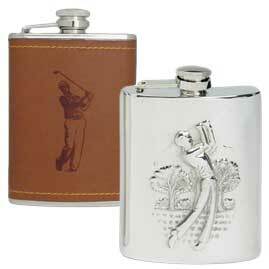 These flasks are great for people who either play sorts themselves or for the avid spectators. For those of you who partake in certain sports such as fishing for example, we all know how lovely it is to be sat by the river, lake or even on a boat in the sea, relaxing having a lovely time. The only things that can make that better is with a little food and drink. The food we cannot help with but the drink receptacle we can. Many sports, well certainly relaxed ones allow a little relax time which allows you to have a little sup on your favourite drink. Obviously you wouldn’t drink if you were a race car driver (afterwards you would of course) but you get the gist. For those of you who are avid supporters then you are good to carry your flask with you to most sports. I have to admit it is lovely to enjoy a little drink with friends when out and about, especially on those colder days when you feel like you need a little warming. 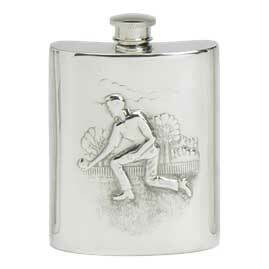 The Pocket Hip Flask Company realise that sports and its and it supporters are very serious about their passion which is why we have many sports hip flasks for you to choose from, from rugby all the way through to shooting and even lawn bowls. 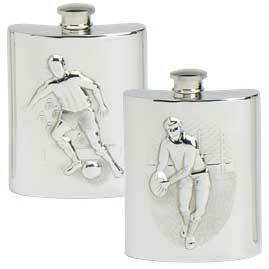 We stock some fantastic sports inspired hip flasks for our customers. 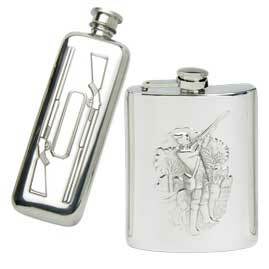 We have an extensive range of shooting hip flasks as well as fishing, horse racing, golf and many others. If there is a sporting hip flask that we don’t sell and you would like to see us stock then please, let us know and we will see what we can do. 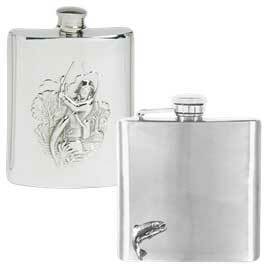 Our sports hip flasks come in both pewter and stainless steel. Some are leather wrapped, some have images stamped onto them. Others have wonderful funky artwork on them and some have beautiful painted badges on. There really is something to suit all tastes. Our flasks are available in varying sizes and shapes. 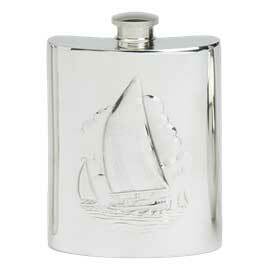 You can even personalise one of these hip flasks with one of our many engraving fonts.